Tommy Walker began his career in EMS in St. Louis, Missouri. 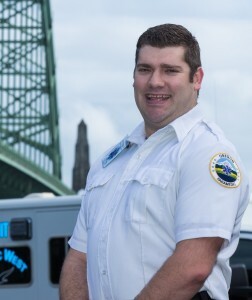 He has since gained almost ten years of experience as a paramedic before joining our family at Pacific West Ambulance. In Tommy’s time as a paramedic he has been a prior Stars of Life recipient, a mentor and preceptor to paramedic students, and an EMS Bike Team Captain. As a bike captain he was responsible for providing medical services for participants at a range of events as well as coordinating medical staff and care. This has given him the ability to be a great leader and a highly qualified and competent paramedic. He has continued to learn and grow his medical expertise, even completing training to become a Critical Care Paramedic, a program that educates paramedics to better understand the needs of extremely sick or injured patients during extended transports to higher levels of care. He finds that being the first line of defense for his community in their times of need gives him great pride. He is a man that truly enjoys serving and making his community proud. Tommy brings a lighthearted but caring energy to our team and displays a passion for providing a genuine type of care to our patients. He has an infectious spirit that helped him integrate and become a valued member of our team. He is always ready to provide a helping hand, tell a joke, or be the one to run command in a time of high stress. His ability to function as a lead paramedic and be the driving force on his calls, while never missing an opportunity to make someone smile or teach someone something, has made him more than deserving of this honor. In his free time, Tommy is an avid photographer and travels with his wife, Karly. Photography is only one of Tommy’s many talents that he is always happy to share. Tommy and his wife lead a happy life of laughter and love. They are proud to say that they actually met at the Stars of Life celebration years ago when Tommy was being honored for the first time and Karly was accompanying her cousin, who was also being honored. The pair has added to their duo by adopting three rescued Weimaraner puppies. Tommy’s days are spent working hard, serving his community and loving his small family. He is a point of pride for Pacific West Ambulance and we hope nothing but fine things for his future.